The plot of Hansel & Gretel: Witch Hunters seems to be written by a narcoleptic trying to blend a classic fairy tale with his own sexual fantasies, and the dialogue is so campy that the writers should consider renting out some cabins and hosting some kids over the summer. The film begins by recapping its own “prequel,” the fairy tale that hopefully everybody interested in the film already knows. From there it introduces Jeremy Renner’s Hansel and Gemma Arterton’s Gretel as twentysomething, leather-wearing witch hunters. They go to a small town in need, and it turns out that there is an elder witch (Famke Janssen) kidnapping children. Of course, this elder witch has a cliché connection to the hero’s background, but don’t worry there is a nice witch (Pihla Viitala) to help save the day. The “plot” would normally be cringeworthy, however for some reason the movie is able to simultaneously be cheesy and completely serious at the same time. There is something endearing about watching actors say the worst lines in a completely serious way. Renner’s acting is just him looking sternly at everything and everybody. Arterton, however, seems to understand the tone of the movie. She is able to say the stupidest lines in a serious way however you get the feeling she understands that these lines are ridiculous. Overall, most of the actors see this inferior dialogue, and act it out with the most serious of intentions. This tone lets the audience in on the secret of how bad this movie is, without broadcasting the fact that the writing is horrible. This writing extends to the violence. It is graphic, visceral, but overall goofy. Whether it is decapitating witches with wires or the classic burning the witch alive, the violence seems to be laughing at itself. Near the end of the movie, Gretel brings out a five-foot-tall crossbow with which she proceeds to skewer multiple witches at a time. The violence seems like director Tommy Wirkola sat in a basement, high, dreaming up machine gun crossbows, and yes they have those. Despite the cheesy writing, the film does present the occasional artistry. The most striking image in the whole film is of the old candy house. Imagine what the candy house from the fairy tale would look like after 15 years. The set for this house catches this rotting, disgusting image and makes it even more gross. It will stick with you even if it is only in your nightmares. This is not the only piece of great set design. During one scene where the village is burning, the intensity of the flames and the claustrophobia of the narrow street, instills a wonderful sense of panic in the viewer. Now, some might say that because I like this movie, it means that I endorse bad writing as long at it makes fun of itself, I don’t. I’m not sure why this movie works, but is does. It does everything a blockbuster B-movie should do: kickass violence, self deprecating humor and awesome visuals. The problem is just because this movie can get away with it does not mean others can. 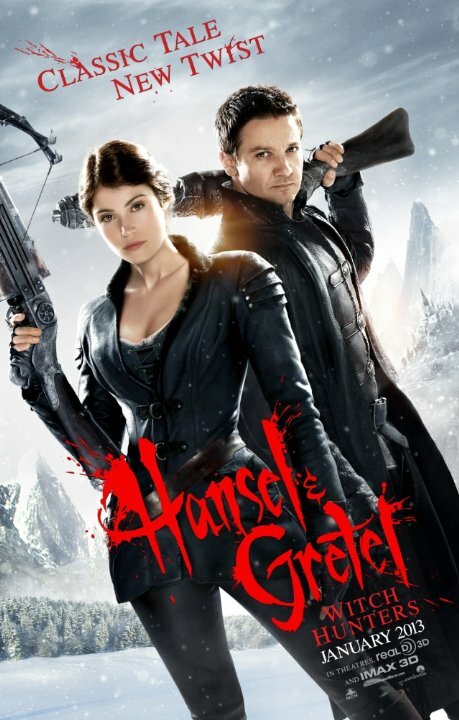 Hansel & Gretel: Witch Hunters is a fun movie, but by no means would I want to watch it over and over again. The name already tells you that this movie does not stimulate the brain. Sometimes you just need a movie with no plot and lots of action to spice up the traditional Forrest Gump or The Shawshank Redemption. That does not mean anyone else should try. Even if someone mastered the B-movie, the B still stands for bad, and that is what this is a bad movie.